Get ready for high diving fun! This soft, floating Ruffwear disc was built for dogs that love to play fetch in or around water. Pontoon-like construction allows the Hydro Plane to float high atop the water for easy visibility (for you and your dog!) Soft on dogs' mouths, and over-sized for easy pick up or an interactive game of tug-of-war. Get ready for high diving fun! 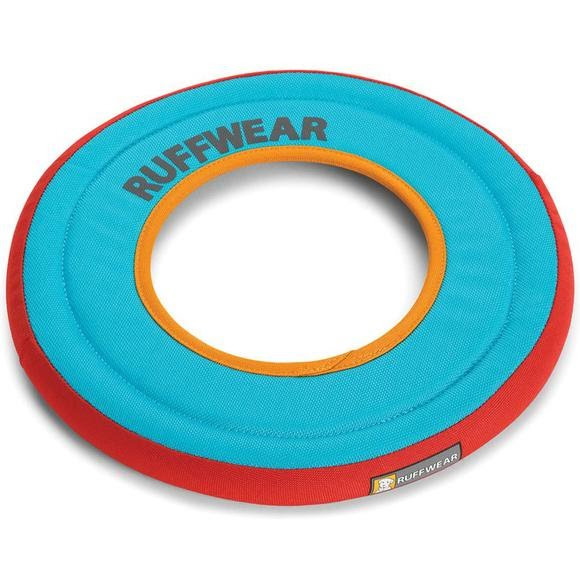 This soft, floating Ruffwear disc was built for dogs that love to play fetch in or around water. Pontoon-like construction allows the Hydro Plane to float high atop the water for easy visibility (for you and your dog!) Soft on dogs&apos; mouths, and over-sized for easy pick up or an interactive game of tug-of-war. She's got loads of toys but this is her favorite...and ours. She destroys toys like candy, has as much energy as she did as a puppy, and loves water. This toy survives it all. Only comment would be to NOT play tug of war with it if you want to keep it longer. We get 1-2 years out of one.....this is our 6th....and we've tried them all. Love these frisbees. I’ve been buying them for 10 years (different vendors) and will continue to for as long as my dog enjoys them!